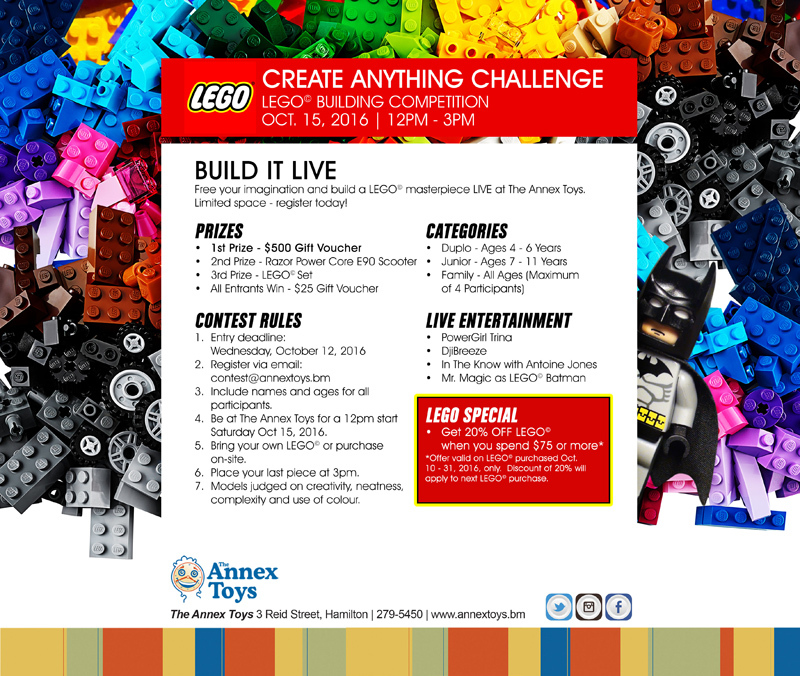 Those looking to get creative and share their imaginations with the world have until October 12th to enter The Annex Toys Create Anything Challenge: Lego Building Competition, the company announced today. Slated to take place from 12pm – 3pm on Saturday, October 15, on the first floor of The Phoenix Centre in Hamilton, this year’s event will see participants build Lego models live on-site at The Annex Toys. Laura Husband, Manager of The Annex Toys says; “In an effort to do something slightly different and a bit more engaging with the community, we opted to host a live competition this year. We also added a family category in hopes of bringing families or teams together for a fun day of Lego, creativity and friendly rivalry. The Annex Toys Lego Building Competition is free to enter and will be judged by creative professionals based on creativity, neatness, complexity and use of colour while taking age into consideration. The grand prize winner will receive a $500 gift voucher; second prize winner will receive a Razor Power Core E90 Scooter, and third prize winner will receive a Lego set. All entrants will go home with a $25 gift voucher. Contestants and spectators alike can expect live entertainment including DJ iBreeze, PowerGirl Trina, In The Know with Antoine Jones and Mr Magic as Lego Batman. The three categories available for registration include Duplo 4-6 years, Junior 7-11 years and Family – all ages [maximum of four participants]. To enter, simply email contest@annextoys.bm including names and ages of all participants by October 12, 2016. Then, show up at The Annex Toys on October 15, 2016, ready to demonstrate your skills.